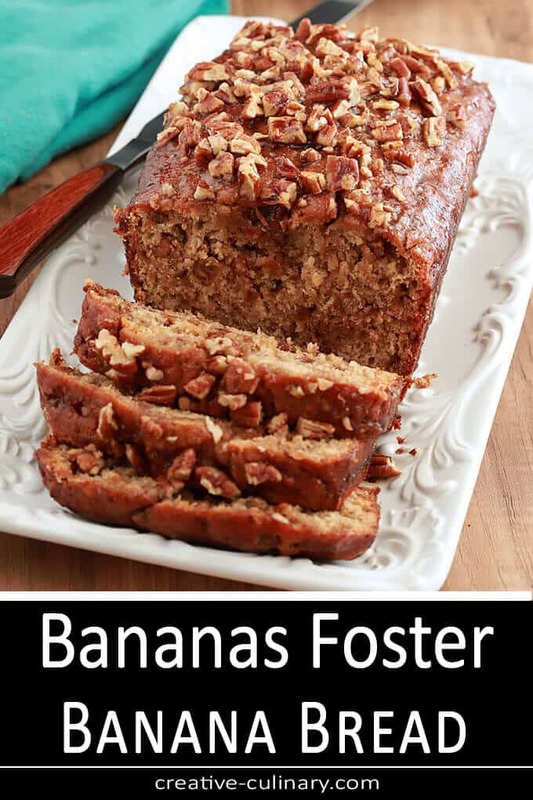 Filled with pecans and toffee pieces and drizzled with a banana, rum & butter glaze, Bananas Foster Banana Bread is the most delicious banana bread ever! That was exactly what I needed to add to the mix for a banana bread I had not quite perfected; one reminiscent of the flavors of one of my favorite desserts, Crepês ala Bananas Foster. A warm mixture of butter, brown sugar, rum, and sauteed banana is served atop a crêpe that is rolled around vanilla ice cream. I wanted that flavor though in a banana bread and Sarah had given me a great start. The toffee…that was exactly what I needed! Sarah’s bread sounded fantastic so I used it as a start; only adding pecans to the toffee in the loaf and then finishing with my contribution, the bananas foster sauce. Trust me, this is totally decadent but in a nutshell, it worked. It was so good as a matter of fact that I did not notify my neighbors about it; nope, I squirreled the whole thing away just for me. I feel some guilt over that and really I shouldn’t, right? The mixing and baking were pretty straightforward. I live at an altitude of 6200′ though and one of my ways to get the bread to form some structure to match the faster rise is to turn up the oven temp by 10 degrees…this aluminum foil collar helps keeps the edges from turning too dark from that extra heat; you might not need it but in case you do? A picture is worth a thousand words! If you’re not trying to grab this loaf of bread, please see your doctor; it is absolutely decadently delicious. And yes, I could eat that syrup with a spoon! When I was making the syrup I started with a pretty standard mixture I’ve used for other baked goods; rum, butter, and brown sugar, and a bit of water. It wasn’t what I was looking for though and then I realized why. Bananas Foster has banana slices sauteed in the sauce…and voila what a difference that made. It also has banana liqueur which would be nice but I didn’t have any and hesitate to insist that you run out and buy some; it’s delish without! The banana released both moisture and flavor and there, that was it, the flavor that I loved. After the mixture cooked and cooled just a bit, I scooped out the banana slices before drenching the bread…let’s call those the chef’s treat. Eat them and don’t share. They are out of this world delicious! When all of that delicious sauce did not soak into the bread I put it to good use, spooning a bit over each slice. You know because this wasn’t already over the top, right? I know for a couple of days I almost ran to the kitchen to make coffee; not because of the coffee so much as what I would be having with it. 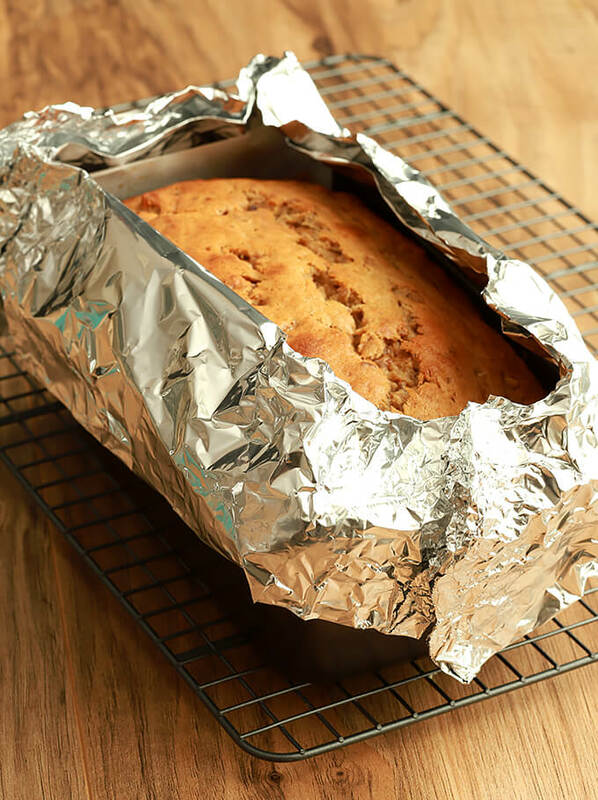 Seriously this is amazing; I venture to say the best banana bread I’ve ever made. Thank you Sarah and Brennan’s Restaurant in New Orleans; I couldn’t have done it without you! 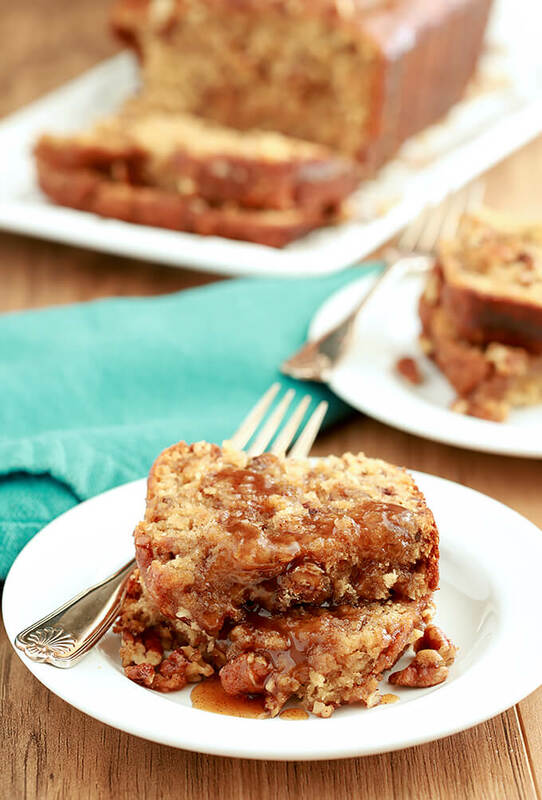 So rich and tender; filled with pecans and toffee pieces and drizzled with a banana and rum butter glaze, Bananas Foster Banana Bread is the most decadent and delicious banana bread ever! Preheat the oven to 350 degrees. Spray a 9-inch by 5-inch loaf pan with cooking oil spray. Fit a piece of parchment paper in the bottom of the pan going across the long end; have the ends come up and sides and have about a 1 inch overhang. Spray it with the cooking oil spray. Set aside. Combine the butter and sugar in the bowl of a stand mixer fitted with the paddle attachment. Mix on medium speed until the mixture looks light and fluffy. Add one egg at a time, beating well each time. Add the bananas, vanilla, and rum to the mixture and mix well on medium speed. In a small bowl, sift together the flour, baking powder, salt, and cinnamon. With the mixer running on its lowest speed, add the flour mixture to the bowl little by little, until just combined. Add the toffee pieces and one cup of chopped pecans to the batter and mix until just combined. Pour the batter into the prepared loaf pan and spread with a spatula to level. 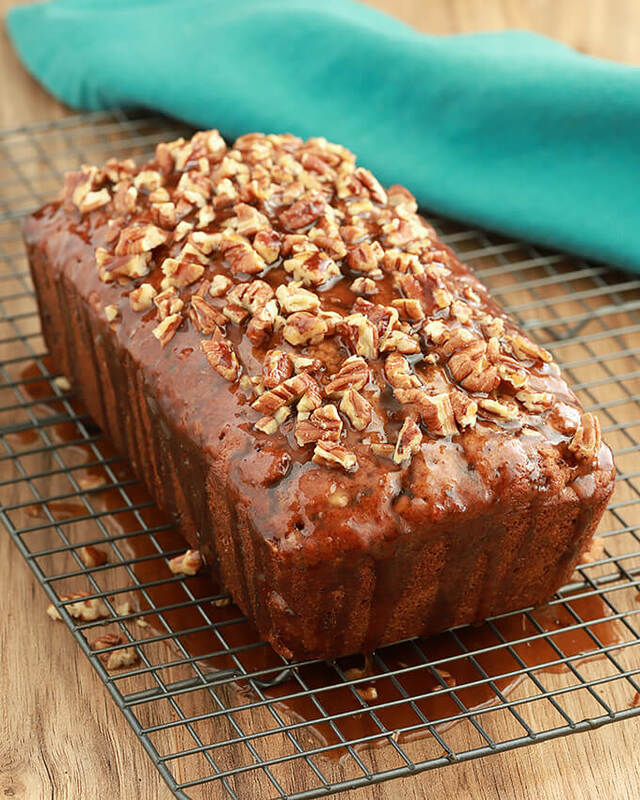 Sprinkle the reserved pecans on the top of the loaf. Put the pan into the preheated oven and bake for about 1 hour. The bread is done when a toothpick inserted in the center comes out clean. Remove the bread from the oven let cool for 10 minutes. Remove the bread from the pan using the parchment paper if necessary, peel the paper off and put the bread back into the pan. Poke a lot of little holes across the top of the bread using a toothpick. While the bread is cooling, heat the water, rum, butter, brown sugar, cinnamon, and sliced banana together in a small saucepan, boil for one minute and then remove from heat, scoop out the pieces of banana and set aside. When the bread has cooled slightly, slowly pour the sauce across the top of the bread, letting it soak into the holes with the excess running back into the pan. Let the bread soak for at least five minutes and then remove the bread to a plate; slice and serve warm. Those banana pieces? Pop them in your mouth for a treat; you deserve it! Because I take photos of my baked goods, I wanted the pecan pieces on the top to be VERY evident so I did not bake them into the bread. I poured on some of the sticky syrup, added the pecans and then poured more syrup over them, slowly, until it was gone. 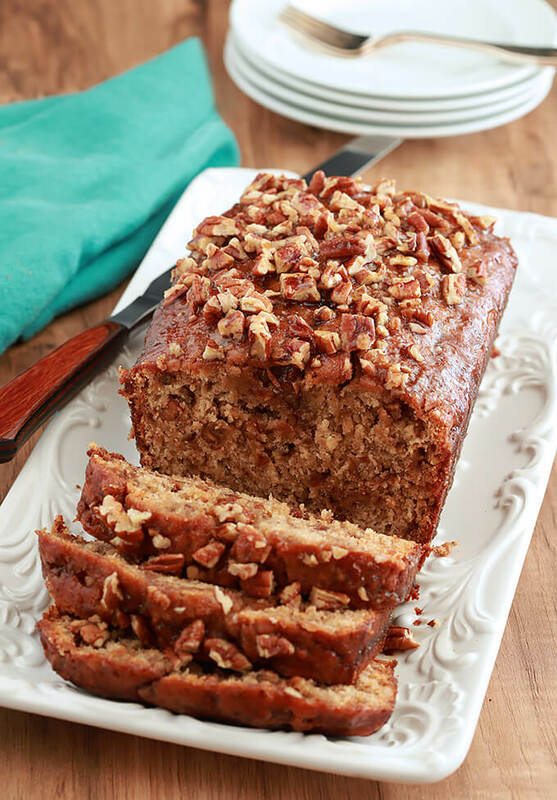 You can make it a bit easier if you choose by simply putting the third cup of pecans for garnish scattered over the top of the loaf to bake with the bread. The will be enveloped a bit by dough so yours will look a bit different but that's OK; the taste will still be divine and the nuts won't fall off the top while you're serving the bread like many did for me! It is I who needs to thank you! I tried this before and was disappointed and really why didn’t I think of Toffee? But that is what gave it that same buttery flavor inside the bread that I wanted to pour on the outside of it so it was absolutely perfect. So, are your neighbors lined up at your door insisting you bake a big batch of these for THEM since you ate the original all by yourself? 🙂 This does look good. Banana Foster is such a fun (albeit old-timey; but then, so am I, I suppose!) dish — great idea to incorporate its flavor in this bread. Thanks!